On draft night, Wills was already familiar with the Holden Centre after being a member of Collingwood’s VFL side in 2015. 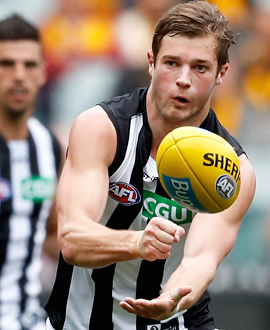 He averaged 17.2 disposals in six games for the VFL Magpies in 2015, before being sidelined after suffering concussion. Prior to making his VFL debut, Wills established a fine reputation playing for Old Scotch in the VAFA. At 191cm, Wills was a key presence at Old Scotch for two years. After dominating in the reserves for much of 2013, he was rewarded with a place in the senior side and gained invaluable experience during the latter stages of the season. He secured a more regular spot in the Old Scotch side in 2014 and was named in the best in six of his 11 senior games. He is a proven ball-winner and a clearance specialist who finds ease getting first hands on the ball in the contest.